Why do I want to make painting temples of the Church of Jesus Christ of Latter-Day Saints my lifelong work. Attending the temple is where we make certain covenants with God. Inside families can be sealed together forever, including husband to wife. Our membership only begins with baptism into the church, the ultimate goal being to bring every member into the House of the Lord, which is the temple. With my art I have always wanted to do 2 things. 1St, share the beauty that I see in the world with others. 2Nd , to further the work of the Lord through my art. The pinnacle of one’s membership culminates in attending the temple and because of my love for the temple, I wanted to use my talent to help show my love and bring to memory the joy they experienced in attending the temple and being sealed together. There has always been within our Church a great emphasis on the history and it’s early beginnings. I also really enjoy and have a great interest in history. It has been in the back of my mind since my career as an artist began, to some day combine my love of painting, history and temples. It wasn’t until we, my wife Jessie and I, returned from our church mission to Ghana that I am now able to start to fulfill my life’s dream to paint each temple in the era they were dedicated. There are amazing stories behind the beginnings, construction and dedication of each temple. I wanted to bring those stories to life and let people know of the fascinating stories and sacrifices those Saints went through to get a House of the Lord built in their area. With these paintings I hope to bear my testimony of the divinity of temples and pay tribute to those who sacrificed and worked to help construct them. And if in the process I can help have images of our temples hang on the wall of every home, the I have done something worthy of those great buildings and the truths taught within their walls. ~A quote by Spencer W. Kimball, a past Prophet and President of the Church of Jesus Christ of Latter-Day Saints. 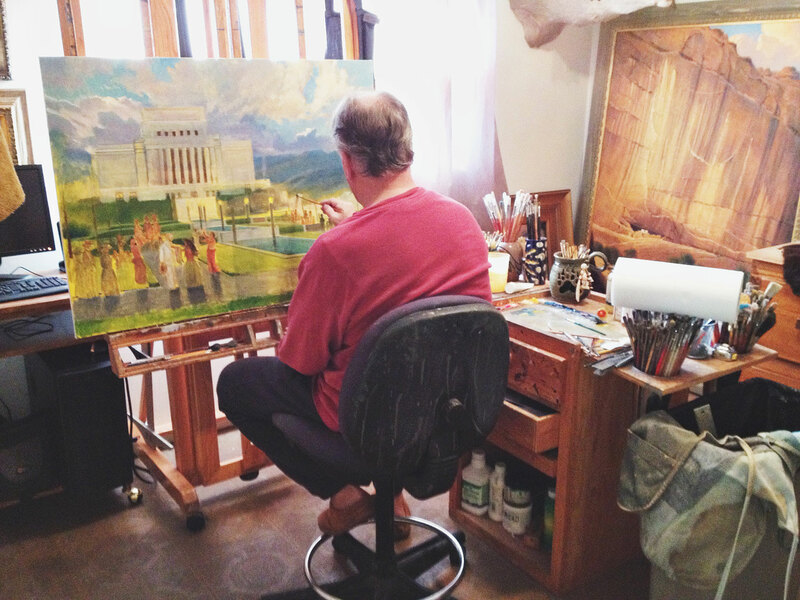 It is my desire that with my art I can help fulfill this challenge that President Kimball gave to every LDS family and have my images of the temple available in every country, every city and to everyone who has ever attended those magnificent buildings.